Rich cities, vast forests and rugged mountain ranges dominate the country. But dangers lurk in the foggy areas around the river. Only the bravest adventurers dare to face the challenges. 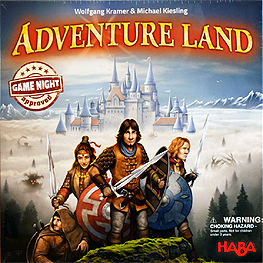 Move your adventurer tactically, bravely fight the fog creatures and win the favour of the king. ...You choose the scenario before you start the game. Before each turn the player draws two new terrain cards showing where to place new items. Take your adventurer to the most lucrative space. But be careful as there is no turning back! Collect gold and companions, and use swords and magic herbs to fight the fog creatures!